To be honest, neither us grew up doing family devotions. 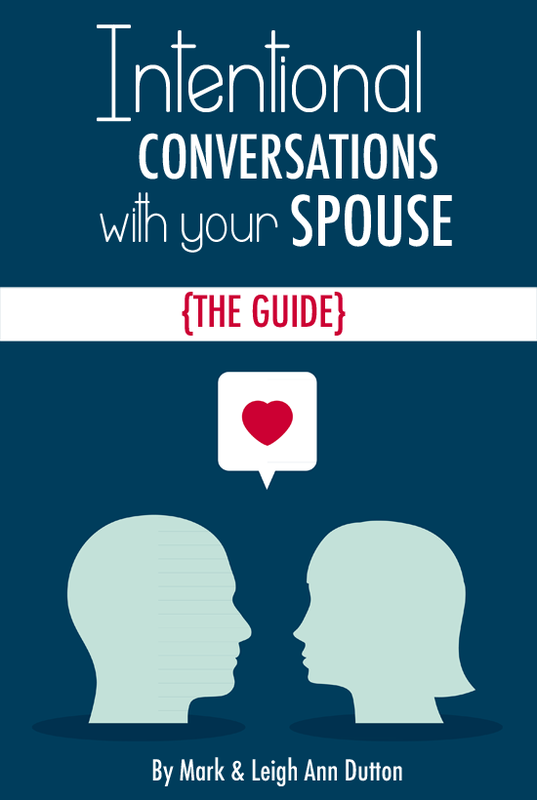 My husband and I have never seen family devotions done, and we’ve only read about them in books. Getting family devotions started in our family was not easy. We didn’t know where to start, how to do it, or even what to do when we did start. Do you do family devotions at sunrise? Breakfast? Bedtime? Three times a day? We didn’t have a clue. Do you sing together? What if none of us plays a musical instrument? Do we read whole passages or just a verse? What about including a toddler who doesn’t know how to sit still yet? 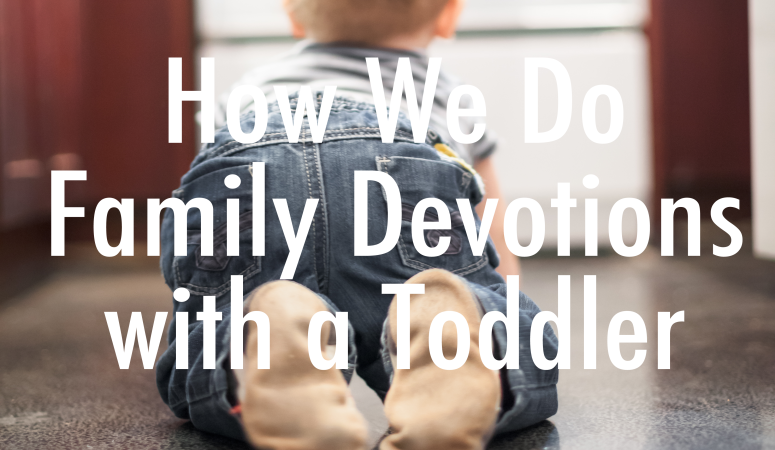 After talking and praying (and talking and praying some more), we developed a plan for family devotions because we believe in teaching our children the Biblical truths of God’s Word. 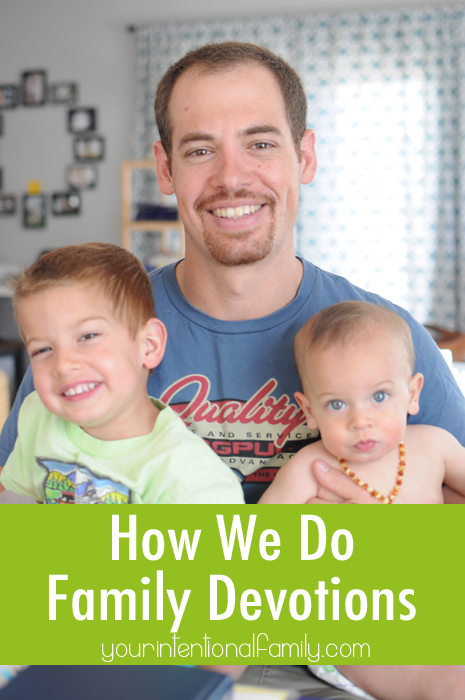 After a little trial and error, we’ve fallen into a routine that works beautifully for our family. We decided to do our family devotions at the breakfast table. 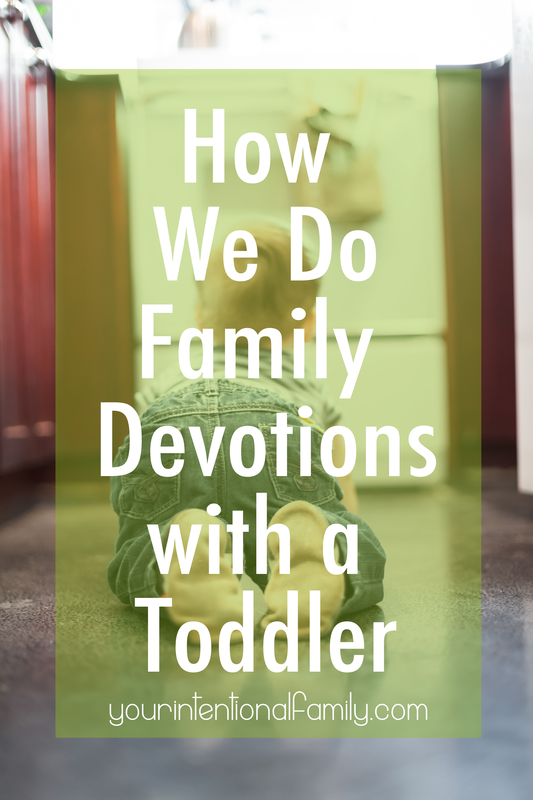 We took a cue from Carrie Ward author of Together: Growing Appetites for God on this being a great time to do devotions with small children in the home. In addition, we consistently have breakfast together. For us, breakfast is a pretty leisurely affair each morning. However, we rarely eat lunch together as a family, and dinner is hit or miss whether we’ll go out to eat, have meetings, invite others over, or something altogether crazy. Plus dinner is always hectic and toddlers are cranky (at least mine are) in the evenings. So, we chose breakfast as the best time to do our family devotions. After everyone has pretty much finished eating (the toddler will pick forever so he’s usually still nibbling), we start by singing a song together. Our two song choices for our two year old is Jesus Loves Me and the Doxology. Simple songs with fundamental truths attached. It’s certainly not the prettiest sound you ever heard, but we have fun and often have to sing the song about five or six times before our two year old is done worshiping. It’s cute. Then my husband will read a short (and I mean short) passage of scripture. There is no rhyme or reason to our reading at the moment. Maybe someday there will be, but for now we’ve read the Creation Story (which was a lot of fun by the way) and Psalms and Proverbs at random. The point for us is to just do something. We’re new at this so we’ll get more structured later (if we want), but for now we are creating a Bible reading habit for our family. Once we’ve read our Bible, we move on to the Catechism. Samuel absolutely loves doing this. I got ours from reformed.org. With our two year old, we are starting with the first five questions of the Catechism. We’ve been consistently, inconsistent (like that?) with family devotions for about two months. He is catching on a lot faster than I expected! I was totally not prepared. We had plans to just do the first five questions until he was three, but if he gets them down, we’ll add five more to our daily routine. The focus is on the fundamental truths of the Gospel of Jesus Christ, and the verses are relatively simple to memorize. Below is a video of our toddler saying his memory verse with Daddy. Finally we wrap up our family devotions with a prayer. We always tell Samuel what we’re going to pray for before we start as a way to prepare him for how long the prayer will be. Then we all hold hands while Daddy prays. This is how we do it most often. However there are days that Mommy’s heart needs to pray, or we will walk Samuel through praying himself. Right now we stick to: God, thank you. In Jesus name, Amen. Nothing fancy, but he enjoys being a part of what he sees us do so often. We do family devotions seven days a week. We do the same exact routine every single day. We don’t do them every day. Our toddler is not always so cooperative. Daddy is not always here. Mommy leads devotions when Daddy travels. Mommy forgets to do devotions when Daddy’s gone far too often. We keep all our material in a notebook beside our kitchen table. And that’s how we do family devotions with a toddler. It’s not fancy, and quite frankly it’s often messy. We drop spoons, we spill milk, and sometimes our little two year old refuses to cooperate altogether. But we persevere by grace knowing it’s not about how it looks, but about our hearts. P.S. 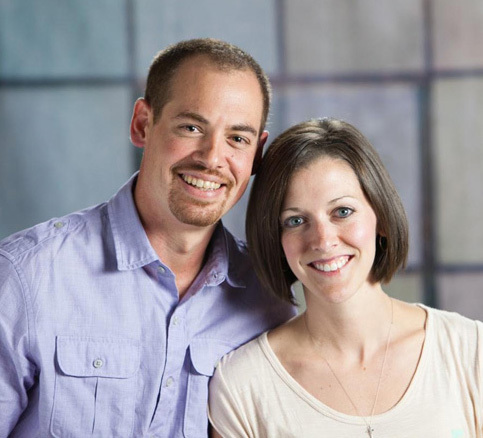 Since this post was first published we have changed a little bit with how we do devotions. 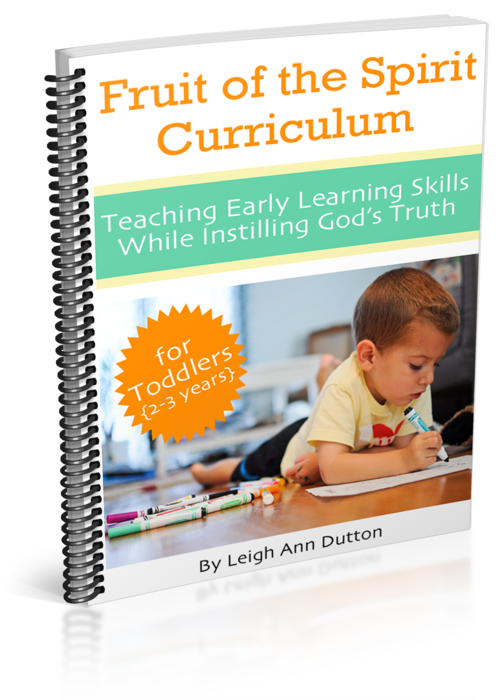 Check out this post here for what we do with our preschooler and toddler.